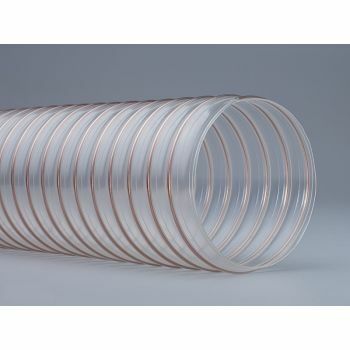 We offer an extensive range of quality flexible ducting products designed to meet the most demanding applications. Material handling, clean room environments, fume control, welding, exhaust, agriculture, cable conduit as well as many custom OEM applications. Ducting hoses for Agricultural Applications – If you are moving grain or other bulk materials, you need a hose that is durable and abrasion resistant. 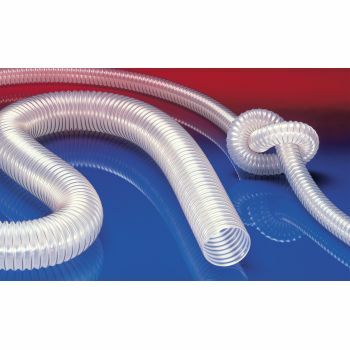 The flexible duct and hoses used for agricultural use need to be tough and durable. It is also a good idea for the hoses to have a smooth interior so that they can maintain efficient airflow. 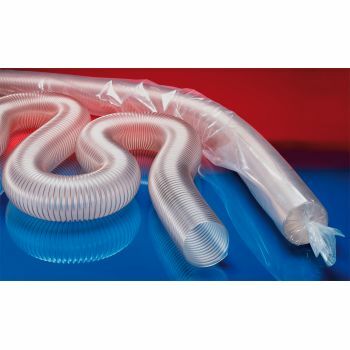 Anti-Static Ducting hoses – Static electricity is hazardous when it is allowed to build up. Static can occur when a physical object is scraped along the interior wall of the hose. Too much static brings the risk of resulting in and explosion and possible fire damage. For any application that requires an anti-static flex hose, you need to use one specifically designed to reduce friction. Automotive ducting Hoses – There are lots of hose products used in automotive applications, from high temperature, to fresh air movement to vacuum hose products. When using flexible ducting under the engine compartment, a flexible hose for automotive applications needs to be able to operate in high temperatures and maintain efficient airflow. Chimney Ducts – A flexible hose for a chimney duct must be made from a metal compound due to all the corrosion involved within chimneys. High temperatures and hazardous materials are constantly moving through a chimney duct, so it needs to be able to survive such contact for long term use. Hoses made from aluminum and stainless steel are very popular for these applications. Dust Collection and Municipal vehicles Hoses – Dust is actually a loose term used to describe small particulate material that ranges in form from fine wood dust to dirt clumps and wood chips. A flexible hose for dust collection usage should ideally be clear bodied so that you can easily see if any clogs/blockages occur. The hose wall of the ducting should also be tough and durable. Exhaust Ducting hoses – Whenever it comes to a heavy-duty industrial grade fume exhaust application, you need a high temperature fiberglass hose - durable hose that can withstand chemical contact. The fumes are often chemical and harmful to humans and can reach temperatures going beyond normal levels, often into the 500° F mark. PU ducting hose FLEXADUX® P 2 PU This flexible hose made of PU is used for suction of air, dust, oil and petrol fumes. This antistatic polyurethane hose is also suitable for applications in the food- and pharmaceutical industry. FLEXADUX P2 PU polyurethane ducting hose has Excellent flexibility, good abrasion resistance and good compressi..
PU Abrasion resistant hose PROTAPE® PUR 301 AS This flexible hose fro PU is used for ducting of gases and for abrasive dust, powder, fibres. The PU abrasion resistant hose PROTAPE PUR 301 AS can be installed in extraction units, dedusting systems, filter system, oil mist extraction as an extraction arm. This particular abr..
PU Abrasion resistant ducting hose – PROTAPE® PUR 330 AS This flexible ducting hose is used for ducting of gases and for abrasive dust, powder, fibres. The PU abrasion resistant ducting hose of this type is used also for printed circuit board drilling machine (PCB). The PU ducting hose PROTAPE® PUR 330 AS is widely installed in gas extraction un..
TPE Exhaust gases hose - PROTAPE® TPE 326 MEMORY This TPE flexible hose/ ducting for hot gases is used with vehicle gas exhaust systems, car gas extraction. engine test benchs, exhaust gas measurement. The ducting hose for exhaust gases can handle temperatures up to 200°C. 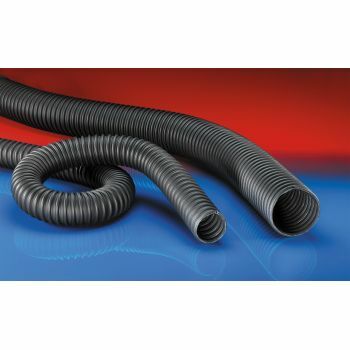 PROTAPE® TPE 326 MEMORY exhaust gases hose is fabric reinforce..